The trip from the banks of Huangpu River to Saadiyat Island is a long one by any measure – more than 6,500 kilometres, or eight and a half hours by jet, or a month at sea on a slow boat. But that is the improbable journey that has been made by the UAE Pavilion, which drew nearly 2 million visitors at last year’s World Expo in Shanghai. The undulating, dune-shaped structure is nearing completion at Manarat Al Saadiyat and by November 16, when it reopens as the host venue for this year’s Abu Dhabi Art Fair, its reconstruction will have taken 11 months and many more than 6 million Herculean man-hours. 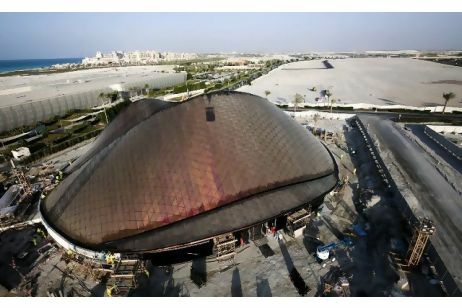 Even by the standards of a country used to delivering complex construction projects to seemingly impossible deadlines, the reconstruction of the UAE Pavilion represents an unprecedented logistical challenge. The Shanghai World Expo officially closed on October 31 last year, and in January the National Media Council, the federal body that commissioned the Pavilion, charged Abu Dhabi’s Tourism Development and Investment Company (TDIC) with overseeing its decommission, shipping and return to the capital. Despite the fact that the Pavilion’s architect, Foster + Partners of London, had created a demountable design from the outset, this was no easy task as the Pavilion was one of the largest and most complex at the Expo. More than 20 metres tall with its intricate, computer-generated geometry and a roof measuring 6,000 square metres, the UAE Pavilion consists of 4,880 structural steel parts, 9,750 cladding sheets and more than 20,000 cladding support components, all of which had to be catalogued, numbered, and labelled before shipping. The structure filled 52 containers, the first of which only arrived in Abu Dhabi in April, and some of the Pavilion’s larger structural beams, weighing up to 60 tonnes, had to be transported as open-sea freight. As the construction deadline approaches, the work on site appears to be reaching its climax. “For the last two months we’ve been a 24-hour-a-day, seven-day-a-week job, and running triple shifts to get the work finished,” Mr Green says. Each stage of the reconstruction project has posed its own challenges, not least because the design of the Pavilion changed in the process of moving it from Shanghai. At the Expo, the building housed multimedia displays about the nation’s history and plans for its future, performances by the National Folklore Troupe and a Dream Journey Prize Draw that brought 16 winners to the UAE for a week’s holiday. At Manarat Al Saadiyat, the Pavilion has been raised on a concrete podium to allow room for a new mezzanine level that will increase the available exhibition space by an extra 600 sq metres. To achieve this, two new staircases and an elevator had to be included and the building’s mechanical, electrical and air-conditioning systems have had to be modified to accommodate the changes in its size and use. For Mr Green, co-ordinating these new features with the Pavilion’s existing elements, on a restricted construction site with so many different workers and trades working simultaneously, is rather like trying build a 40,000 piece jigsaw. The other major complicating factor is the accelerated pace of the project, but for Mr Green this was just another part of the learning process. Walking around the Pavilion, I begin to understand just what he means. Even though parts of the cladding are still being fitted and the building is yet to be sealed, exhibition contractors have already started rolling out carpet, while outside, underground utilities and the landscape are being installed simultaneously. It is both inconceivable and unsurprising that in the past week almost 66,000 man-hours have been recorded, and when viewed up close with an army of workers teeming over the structure, the Pavilion looks less like a sand dune and more like some giant ant’s nest. Everything, everywhere, is moving. When the UAE Pavilion finally opens, more than one organisation will have reason to celebrate: some journeys will have ended, and others only just begun. Abu Dhabi Art is the immediate beneficiary, having effectively been given a purpose-built, starchitect-designed gallery space better suited to the display of contemporary art than the somewhat incongruous surroundings of its previous home, the Emirates Palace hotel. Local commentators have already identified this move not only as an attempt by the festival to align itself with its illustrious future neighbours on the island, but also as an important statement about Saadiyat’s increasing emergence as a cultural destination in its own right. If the organisers of Abu Dhabi Art have reason to be pleased with the arrival of the UAE Pavilion, Foster + Partners must also be quietly congratulating themselves. Despite only being involved at the Shanghai stage of the project, they have succeeded in adding to a UAE-based project list that already includes Masdar City, Abu Dhabi’s new souq and Central Market, the planned Abu Dhabi World Trade Centre at Al Raha Beach, The Index in Dubai and the Zayed National Museum that is also planned for Saadiyat. Given TDIC’s recent announcements of delays to some of its flagship projects, the timing of the forthcoming events must also have come as a coincidental but much-needed organisational fillip. TDIC recently restated its commitment to the delivery of the Guggenheim, Louvre and Zayed National museums, which it described as “strategic components of Abu Dhabi Government’s vision for the emirate”. Speaking earlier this year, Mubarak Al Muhairi, TDIC’s managing director, welcomed the UAE Pavilion as “the next step in the island’s journey to become a hub for cultural, architecture and educational excellence”. On Wednesday, after a long and eventful journey, the UAE Pavilion will not only become the latest of the UAE’s architectural landmarks, it will also become the latest member of a very select architectural club, one reserved for Expo buildings that managed to survive their host event. That list of survivors includes such architectural luminaries as the Crystal Palace and the Eiffel Tower, but whether the UAE Pavilion comes to enjoy the same levels of public recognition and affection as these illustrious club members is a question for the future. One thing, however, must be certain. For one project manager at least, the day of the Pavilion’s completion will live long in the memory.